We got up very early the next day, since we were still working on UK time, and came down for breakfast promptly before 7am. Too promptly, since there was nobody there, and the dining room was closed. We waited outside until the surly hispanic cleaning lady, dressed in brown to match the decor, came to open the gate. We took a table by the window and waited for her to get the bagels out. The kids had iced doughnuts, and we had bagels and jam, with the butter coming in incredibly tiny tubs, so you needed four tubs to do one side of a bagel. The drinks were nasty OJ from a machine. Not the best NY breakfast you can imagine but it was free, so we made sure we ate a lot in preparation for the day ahead. Looking out the window at NYPD cops eating doughnuts in their cars (yes they really do that!) we could see that it was going to be a fine day, but we packed the umbrellas, just in case! We hit the street just before 8am, knowing that the Empire State Building opens its doors then, and wanting to be first in line. We wandered along 34th street towards 5th Avenue, looking up at the massive building. The sun was out but it was hazy. Outside the front door, two guys were trying to sell us tickets to the Skyride, but we ignored them and went inside to the foyer, where the walls and floor are all marbled. We waited in line along the righthand side of the foyer, and I asked one of the concierges if the ticket men outside were selling tickets for this or something else, but he told me they work for the building but were selling tickets for another thing. We took a couple of pictures of Connor with his school bear. Eventually the queue moved, and round the corner we had to go through airport-style security, with walk-through metal detetctors and a bag search. We were pretty near the front of the queue for tickets, and I handed over a $50 bill to cover the entrance fees. The high speed elevator took us most of the way up, and a smaller elevator took us to the 86th floor observation deck. They cleverly take you out through the shop, but we ignored that for the time being and went straight out onto the observation deck which completely surrounded the building. We took a few photos, and I spotted the hotel we were staying at, way down in the confusion of buildings. It was early morning misty, so all the downtown skyscrapers were a bit hard to see, but the sun was out and it was a fantastic view of the East River and the Hudson, and north to the odd sharp rectangle of Central Park. When we'd had our fill of the fantastic views, we came back into the shop and bought a few souvenirs. I bought Karen a New York T-shirt, and the kids bought tacky ornaments for their friends. After another quick glace out of the window at the sunny morning, we made our way back down the two elevators to street level. 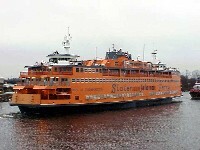 We didn't really have a plan of what to do, so I suggested we make our way downtown to the Staten Island ferry. We could have walked, but it was a long way, and we didn't want to waste all of the good weather walking, when we knew it could turn to rain in a second. We walked back to Penn Station and into the subway. The wall map was very confusing, and I couldn't see South Street on the map at all, which according to my pocket map, was the station closest to the Staten Island ferry terminal. So I went up to the ticket booth and asked what train I should get. The black guy in the booth told me I should get the R or W train to Whitehall St station. I asked how much for two adults and two kids and he said that if he couldn't see the kids over the desk then I didn't have to pay for them, which made us laugh. It was a very high desk, by that logic, I shouldn't have to pay for Karen either! We went round the corner where he directed us, and through the ticket turnstiles, putting the tickets through two times for the kids. The small platform was much narrower than underground stations I was familiar with, and we stayed close to the wall until a W train came along, and we jumped in and got seats. The journey took about 20 minutes, and I kept an eye on the subway map so we knew where to get off. As we got close to Whitehall, a black guy crossed the gap between the next carriage and ours, and just stood a bit menacingly in front of us. Karen said later she was scared, but he just got off the train like everyone else. We went through the full height turnstiles and up onto the street. As soon as we got out, it was clear this part of NYC was very different from the Midtown area. The buildings were huge, and after consulting the fold out map, we headed towards the water. The Staten Island Ferry terminal building was having some renovations out front, so we walked past all the workmen and into the modern terminal. Most of the people were waiting at the rightmost gate, so we joined the crowd, and soon enough, people started walking past the giant glass windows as they got off the ferry which had just arrived. We waited until they had all gone, and then the huge doors opened, and we all made our way onto the orange ferry. We sat inside for a bit, but since the weather was so nice and we wanted to take photos, we went outside onto the starboard deck. The ride across was superb, seeing Manhattan drift away into the distance was great, and we had great views of the Brooklyn Bridge, Ellis Island, and we passed very close to the Statue of Liberty, close enough to get some decent photos with Connor and the bear. For some reason, Connor went into a strop on the ferry and was given into trouble. At the Staten Island end, we tried to stay on the ferry since we didn't really want to see Staten Island, but two or three stern announcements let us know that nobody was allowed to stay on. So we got off and sat around the terminal, which was a mirror image of the one in NYC. We bought some cokes to pass the time, and after about half an hour we were let back onto the return ferry and did the trip back to lower Manhattan, and I got to fulfil a very old dream of mine that I'd had as a child, stepping off a boat onto the harbourside in New York. Back on dry land, it was still only mid morning, so we decided to go for a walk up through the financial district. We stopped at the famous Wall Street bronze bull, where we waited for some tourists to move so that Connor and I could get a good rub of the bull's balls for luck. 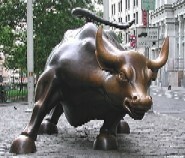 They were well worn and shiny from all the traders who habitually rub them for luck at the start of a day's trading. We walked up Wall Street, the centre of the financial world, and wandered around some of the huge buildings in this part of downtown. 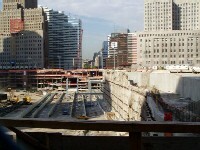 We made a decision to head a couple of blocks west to see the Ground Zero site of the WTC. We hadn't been sure if we wanted to go visit it at all. This was a bit close to our hearts since it happened on the day we were due to fly home from Florida in 2001, and our flight got cancelled and we had to stay on for a few extra days of worry, followed by a scary flight back to Gatwick. Those days in the hotel room, looking at the pictures of the destruction in NY, wondering what was going to happen next, and if we'd ever get home, were quite scary, and we had mixed feelings about going to the place where it had all happened. But it seemed churlish to not go, when it was so close, and we guessed that connection we had with that time wouldn't be hurt by a quick visit. So we walked a couple of blocks west, and up the east side of the WTC site, looking at the pictures on the hoardings which still surround the building site, and the cross made out of twisted girders. The entrance to the subway station, cut off a few feet from the pavement, was the most moving. We got fed up with japanese tourists getting their photos taken in front of the site, so we headed back east again towards city hall, a little bit quieter, where we cheered up a bit with the majesty of City Hall and the wonderful buildings. The sun was out and the streets were hot, so it was tough going. After a few wrong turnings we found the right route up towards Chinatown, and it became obvious when we were getting close as the number of caucasians dropped alarmingly until we were the only non-Chinese people around. Having the kids in tow, we kept to the main streets, though some of the little back alleys had interesting shop signs and stalls, another time we will go down there. We had been hoping to catch some lunch in Chinatown, but we were still too early for eating, none of the eating places were open anyway. The sun was so hot by then that Karen feared that the kids were going to get badly sunburned, so we headed into a drugstore in search of some high factor sun cream. Everyone in the store was Chinese, but they were incredibly friendly, and I gave the kids a couple of dollars to spend on sweets. We passed the NY end of the Manhattan Bridge as we crossed out of Chinatown and into the Lower East Side and Little Italy. There wasn't much Italian about this part of Little Italy, just a few flags and restaurants. The sun was very hot and the streets became a bit more dilapidated as we made our way up the Bowery towards our next destination, deep in the heart of the bad old Lower East Side. The shops vanished, being replaced by fast food equipment suppliers, and lots of men in wifebeater t-shirts sitting on the pavement smoking. One creepy guy at a crossing said I had a beautiful family - I was sure he was going to offer to swap me a packet of smokes for them! At last, we reached 315 Bowery, an historic address and a famous NYC landmark, but one which most tourists haven't heard of and don't plan to see. Which is a shame, because this was CBGBs, the famous punk rock club where many of the great names started or fostered their careers, and a place which the new generation of punks today revere as a shrine. The Ramones played their first gig here, Blondie, Television, Talking Heads... the list is endless. We went in the door, and being daytime it was completely deserted. The hippie on the door let us go inside when he heard we'd come all the way from the UK, and we all went inside along the bar and up to the stage. I couldn't believe I was standing in front of the stage of CBGBs! The place was dark, dingy, filthy and smelled pretty bad! It was brilliant! Since nobody was there, we let Connor climb up onto the stage, which is wedged into an awkward corner of the long hall. An absolutely brilliant experience, and as I had my photo taken outside, I hoped that their lease troubles would be over soon, and the club would continue. Out of CBGBs, we had no reason to stay on the rather scary part of the Bowery, with all its homeless people. So we headed immediately west back into Little Italy and by this time we'd been walking for miles and had missed lunchtime and were absolutely starving! We stopped at an Italian sandwich deli, and were perplexed by the menu and ordering system, where you had to tick what you wanted on an order sheet and hand it over to the sandwich chefs. We ordered some beautiful chicken salad sandwiches, which refreshed us greatly, and we were ready to start making our way uptown on our journey up Manhattan. 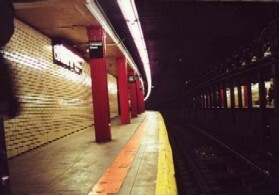 By the time we got to Broadway again, our feet were starting to be very sore, so we decided that for sanity's sake, we should jump on the subway again, which we did, getting off at 34th St and hobbling the last few yards to the hotel for a rest. After an hour resting, complaining about sore feet, we were ready to go north from the hotel, and hopefully this time make it to Times Square without being rained off, and beyond to the south entrance of Central Park. The feet were sore, but we hobbled on. 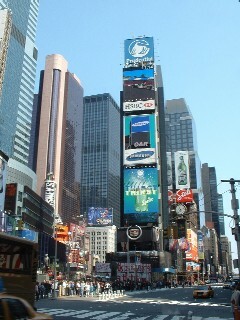 Times Square was amazing, there are no words to describe it. On the one hand it's a terrible display of naked consumerism, on the other, a vibrant and exciting crossroads of the world's people. The shops are full of tat, and every sort of food you can imagine eating is there. There's a law in NYC that states that any building in Times Square is forced by law to have the first few floors covered completely in advertising. The oddest thing about Times Square has nothing to do with the advertising, lights, or people. It's the fact that it isn't a square at all. It's where the north-south 7th Avenue meets the meandering Broadway at a very steep angle, which generates a long wide figure-X intersection, with two very pointy triangular buildings at each end. Add in the neon, video displays and advertising, and you have a very odd and spectacular place indeed. This is before you add in the Naked Cowboy! We didn't stop long there, because we wanted to get to Central Park, which is several blocks farther north from here. We had always planned to have a horse and carriage ride around Central Park, and it seemed as good a time to try as any. With feet hurting badly, we pushed on the next ten blocks up 7th Avenue until we got to the southern edge of Central Park. We crossed 59th Street and entered the park proper, and began to walk inside to see how far we could explore. Connor and Niamh enjoyed climbing on the odd rocky outcrops that dominate the park, and we rested a lot, due to the excessively sore feet. Eventually we admitted that we were not up to long walks, and since the park is huge, we'd be better waiting for a horse and carriage tour. We turned back and made our way to the south entrance again. We headed east along 59th Street, past the Plaza Hotel, which Connor wanted to see because it was the setting of one of his favourite movies "Home Alone 2". As we passed it, loads of NYPD cars started arriving and parking diagonally against the sidewalk. People were gathering, imagining some sort of incident. I stopped to ask a female cop, and she eyed my tattooes as if I was Straight Outta Compton, and told me it was a drill, not to worry. So we shrugged and moved along. We went on to the place where the horse and carriage rides start, but there were no horses and no carriages, plenty of horse crap around though, so we knew we had the right place - it was only mid afternoon, so we were very puzzled. 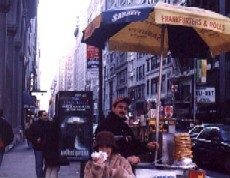 But we were also very hungry, so we stopped at an authentic NY Sabretts hot dog stall and ordered some of their finest franks, which we ate hungrily. It had always been an ambition of mine to eat a hot dog on a NY street corner, a la Cagney and Lacey, and since we hadn't found the horse and carriage rides, we enjoyed the frankfurters on a park bench against the wall of Central Park, watching the Chinese street artists do people's portraits for $20. When we were fed and watered, we consulted the map and discovered we were not very far from some of the shops on 5th Avenue, especially FAO Schwarz, the big toy shop we were familiar with from our Florida trips. The kids loved it, especially the famous giant piano keyboard from the movie 'Big', which they played on for ages. The shop were clever in selling what they implied was the same thing for $20, but on closer inspection it was a cheaper, nastier fold out plastic version. The kids were not too happy when we decided that the afternoon was wearing on and it was a 20 block walk back to the hotel from there, which would take a long time. If we wanted food, we'd have to make a move. The walk back down from 59th Street to 34th Street took over an hour, and our feet were killing us by the time we got back to the hotel. So much so that we couldn't bear to go out again in search of food, and instead went to the chinese place on 7th Ave across from the hotel, which was a buffet style, fill-your-tray take-away joint, with plenty of sticky rice, noodles, chicken, mushrooms, crispy duck etc. They had a seating area upstairs, where you could eat your food, so we did that. The kids had happy meals from the McDonald's next door, and afterwards we retired to the hotel to rest our feet. Still a little on UK time, we fell asleep early in the NY heat.